A Century of Serving: A Centennial Cookbook Celebration NOW ON SALE! With nearly 250 recipes, many accompanied by photos from renowned photographer Joshua Foo, the book provides a plan for a delightful dinner, a perfect party and everything in between. Buy your book online or in-person at events throughout the fall and holiday season. Proceeds from the book will support the Junior League of Omaha’s training and community initiatives. Please note: All online orders MUST be shipped. Bulk orders of 10 cookbooks receive discount pricing. To order more than 10 cookbooks, separate orders must be placed. Contact cookbook@jlomaha.org with questions. 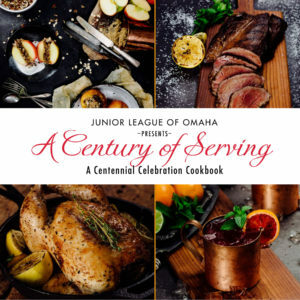 Purchase your JLO Cookbook in person at League General Membership Meetings, the Omaha Farmer’s Market (select dates), the Aksarben Farmer’s Market (select dates) and the Lauritzen Garden’s Antique & Garden Show.